This is a light and easy to make brioche recipe. The whole process is considerably shortened by eliminating the sponge, preliminary rising and chilling the dough. You can even use your bread maker to bake one. Without much hassle, this dough turned just amazing as regular brioche but with less butter and without egg. If you don't have a brioche pan, the other alternative is to use your muffin cup, they came out perfect! Scald the milk and butter, mix in sugar and let cool until lukewarm. Combine flour, yeast and salt in a mixing bowl. Add in milk mixture to the flour and forms into soft dough. If it appears too dry add in milk by a tablespoon at a time. Knead by hand for 10 minutes, transfer onto greased and covered bowl and let rise until double for 1-1 1/2 hours. Punch the dough down, divide into 10 ball. Shape each into smooth round ball, only use 9 balls. Brush each ball with evaporated milk. Place the balls onto baking sheet. Shape remaining one ball into small balls. Make a deep indentation on each bigger ball, place the smaller one on top. Let rest for 45 minutes. Towards the end of rising time preheat the oven @ 180 C.
Bake the rolls for 20-25 minutes until golden brown. Remove onto rack to cool. Nice recipe there.Eggless version,I loved it.Thanks. OMG - that looks so fluffy and delicious! thanks for sharing. Kak nampak sedap tu...Lama tak sapa akak kan??? 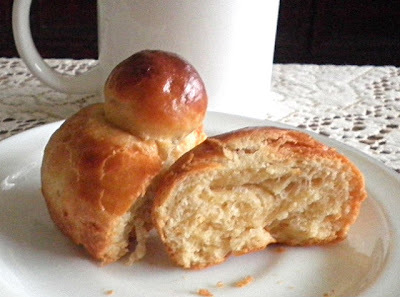 Seriously cant take my eyes from ur irresistible click,super tempting brioche. This has been in my todo list for a long time!! Urs looks perfect!! This brioche is gorgeous! Perfect crumb and perfect shiny crust! These do look fantastic! I haven't made brioche for many years since my family has food allergies. This recipe gives me new hope! With 4 other bloggers, I'm launching an allergy-free blog hop tomorrow. I'd love for you to share this recipe! Our readers would love it. You can find it at willingcook.com. Hope to see you there! oh I finally tried a brioche this year, it had chocolate chips in it,I so have to try your recipe. These look wonderful .I am going to book mark and try. 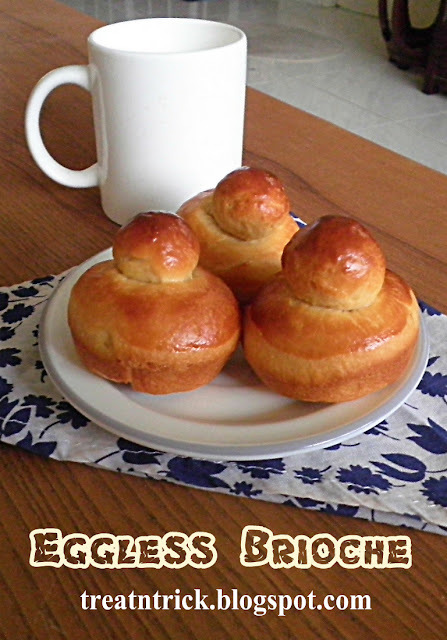 Wow, your brioche looks great, and healthy since there is no egg in it. Looks super good !! Never tried to bake something eggless sounds interesting !! Thank you for the recipe. It looks so yummy!! This fluffy beauties look addictive. Eggless n unique recipe.Done Perfectly delicious Dear. So pretty! I lack the patience to make anything look so pretty, I am impressed! Thanks for sharing your idea on Allergy Free Wednesdays! these brioches look absolutely georgeous!!! These look so yummy. If you ever want another place to link to, I have a weekly fri-monday lany. I wish I had a bread maker now. That looks amazing! I need one. Now! :) Stopping by from Fun Stuff Fridays! What gorgeous little brioches! The recipe looks quite easy for a non-baker like me. It also looks like a very tasty yeast bread. It's been saved! 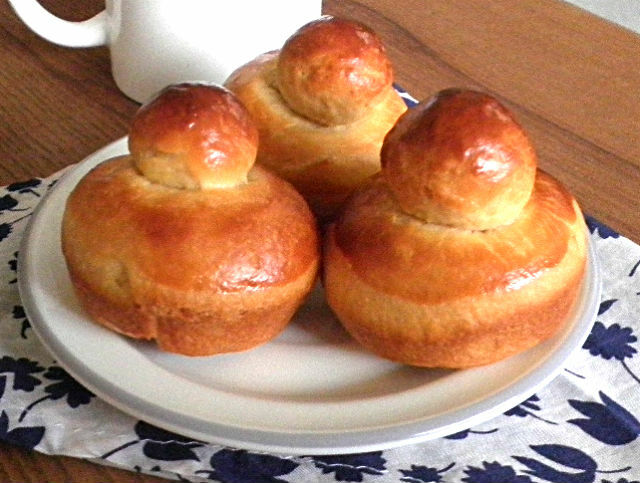 I love baking brioche (love the buttery taste) but never thought to try without the eggs. Wonderful idea - love it! Looks scrumptious! Would you like to link up to my Allergy Friendly Lunchbox Love link party? It has been a while not baking new bread. You have just gave me new recipe to try out. Thanks for sharing. Ok, i was skeptical at first. But oh my god! I used your recipe and it has come out so yummy n soft!! My sister is allergic to eggs but loves baked stuff, and am so happy cuz she will love this..mine came out just as yours in the pic but less shiny.. I doubled this & substituted the dairy (almond milk & water instead of milk, Earth Balance instead of butter) in order to make THE BEST king cake I've ever made, and the first that was totally vegan. Bless you! 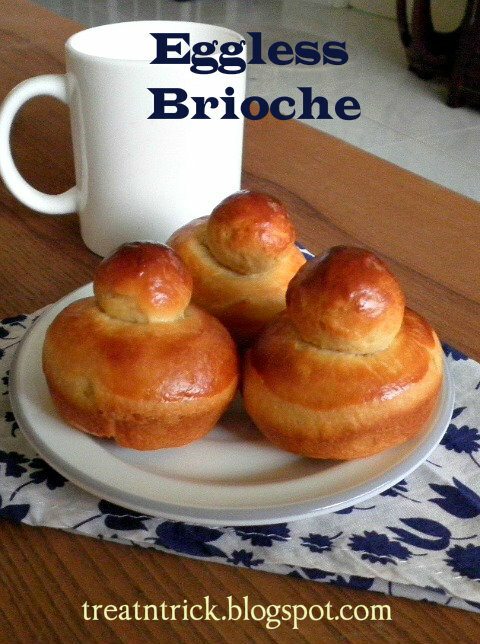 Brioche is on my baking challenge list and I'm looking forward to trying your recipe. You make this look so easy! My brioche never looked that good! Thanks for sharing at the What's for Dinner party!